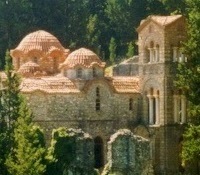 The church of the Virgin Hodegetria was built between 1310 and 1315 by its abbot, Pachomios, to be the new Katholikon of the Brontochion Monastery. Pachomios was no ordinary cleric; he was cosmopolitan, a book collector, an intellectual, and not only well-to-do but well connected. In imperial circles one meant the other. Immediately prior to the construction of this church Pachomios visited Constantinople where he circulated with other ecclesiastical movers and shakers and was well enough known to be referred to by the court poet as “the pride of the Dorians” a pretty reference to ancient Sparta. He obviously soaked up more than just the atmosphere of the capital because, when he returned and built the elegant Virgin Hodegetria, many of the capital’s architectural touches were included in its design. Pachomios had every reason to be pleased with Constantinople. 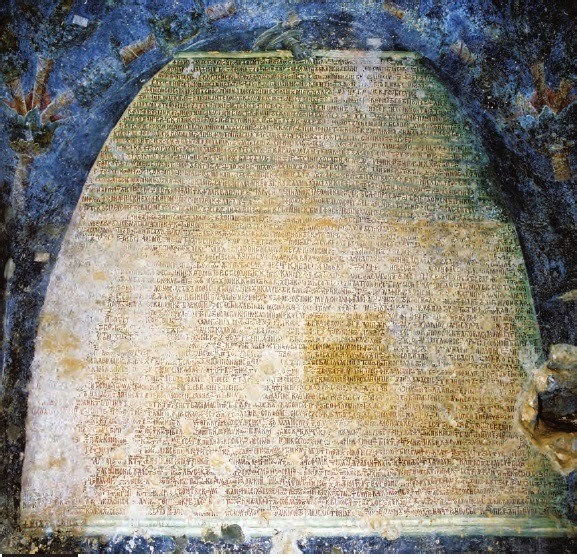 He had come back with one of many future Chrysobulls, (documents signed and authenticated by the emperor’s famous gold seal) which endowed his monastery with enough land, mills, and land laborers (peasants called paroikoi) and with an all important exemption from taxes to ensure its future independence, wealth, and prestige. A typical Chrysobull. Some were fancier. All had the gold seal and the emperor’s signature in cinnabar, a colour only he could use. 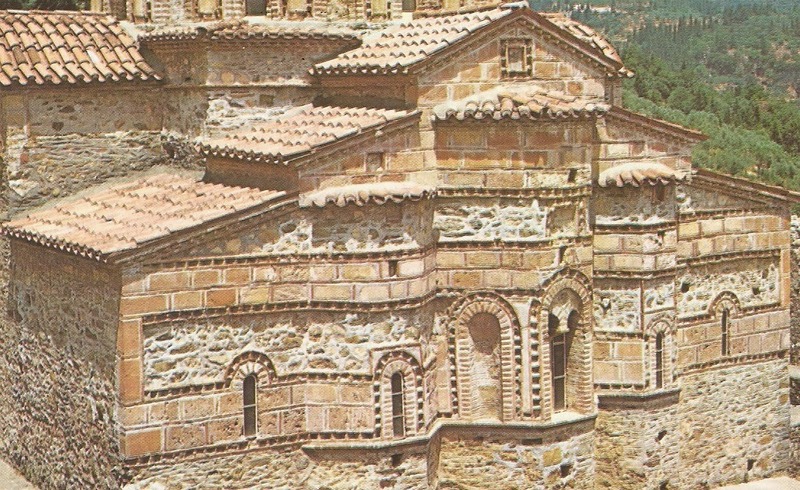 Just what services this dynamic abbot had rendered to the empire is not clear, but that the Byzantine court regarded him as ‘their man in Mystras is. The monastery acquired and continued to acquire so many resources in the area of Sparta and elsewhere in the Peloponnese, that it was virtually a self sufficient fief and so wealthy that the new church came to be referred to by locals simply as the Aphendiko (the ‘head man’ or ‘boss’). 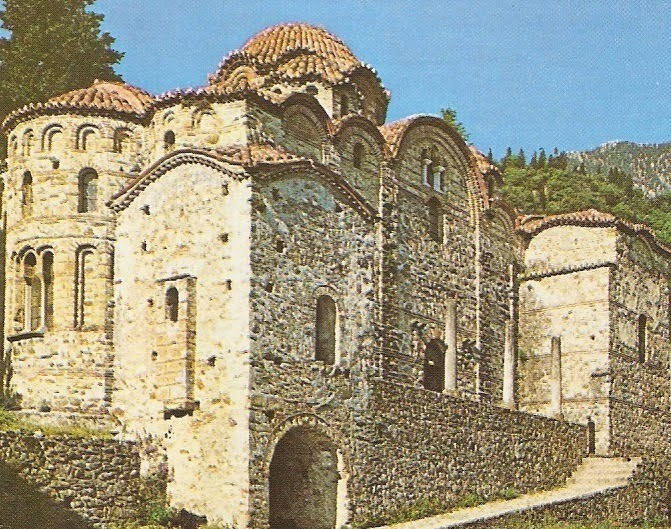 Pachomios was one of the most prominent members of local society until his death in 1322 and his monastery became the richest of all the monasteries in Mystras. 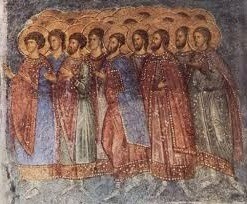 For the Hodegetria’s design he took a page from the much larger church of Agia Ireni in the capital and built a five domed cross-square church that instead of having the dome resting on four pillars, had the entire elegant superstructure laid out upon on the base of a three aisled basilica. 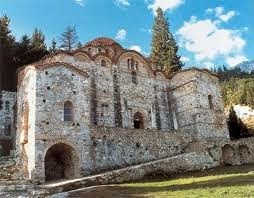 This design so impressed his fellow citizens that two other churches in Mystras would copy it and it has become known as the Mystras style. Before the days of reinforced concrete, the construction of this multi-domed wonder would have been a tricky enough using four pillars. His effort was an even more complex undertaking because of weight distribution issues. 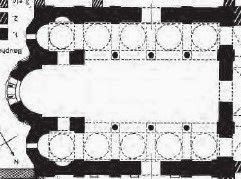 The three columned aisles of the basilica below would bear the brunt of the roof and gallery. So, to help, tall, thin vertical buttresses were added to the north and south façade as supports and in the side aisles downstairs saucer domes were used to create a sturdy enough ceiling to support the gallery and roof. And when the rounded roofs of the side chapels plus the domed narthex on the west were added to the mix, it was truly impressive. to the use of exterior colonnades or porticos outside. These elegant porticos are no longer in place (just three columns on the north side remain – see above picture). But the Aphendiko was the ‘boss’ in another way as well. If its architecture was a nod to the capital’s style, then the Aphendiko itself was the source of many design details seen today on many of the churches in Mystras. In the eyes of the townspeople, it was simply the best. The Aphendiko departed from its Peloponnesian predecessors in one startling way: It abandoned the usual Byzantine cloisonné masonry and most of the other frills we associate with Byzantine churches (see Agioi Theodoroi built 40 years earlier for the same monastery) and used ordinary albeit carefully cut stone for all exterior surfaces except the Bell tower. (2) Builders broke the monotony subtly with narrow rows of horizontal bricks. 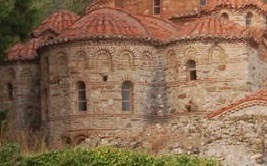 I am not sure why the usual Byzantine folderol was abandoned (shortage of the proper stone?) but the effect is strangely harmonious. Rubble masonry was often used for the sides of Byzantine churches which did not ‘show’ (see the south side of Agioi Theodorioi), but the Aphendiko’s masonry is much more elegant than that; the same technique was employed in the narthex and chapels which are contemporary with the main church. So, in the end it is the cloisonné masonry of the bell tower that seems out of place. When you enter the nave, the effect of those low ceilinged saucer-domed side aisles only emphasizes the height of the central space of the nave as it rises to the gallery and domes above. The height of the central apse –extending uninterrupted to the height of the roof, helps to emphasizes the effect. In better times, this marble revetment would have called for mosaics above but even the abbot’s budget had its limits and the Aphendiko made do with frescoes. This is either the boring part or the whole point of the visit, depending on your interests. Compared to other churches, the main church offers slim pickings because the missing revetments leave just a few bits in the sanctuaries, some martyrs on in the tympana under the arches of the columns, and various saints and cherubs in the domes of the side aisles – all pretty much what you would expect. This church has no surprising deviations from the iconic program. The narthex has more to see. The galleries have even more (Parts of the Twelve Feasts remain) but are harder to discern since you are not allowed upstairs. Opera glasses and a flashlight never go amiss at Mystras. In the small domes upstairs are the seventy apostles, and on the domes of the corner chapels Biblical patriarchs and prophets surrounded by cherubim and seraphim. My own strategy is to look for favorites and see what has been done. Those who know mention the broad and sure brush strokes of the painters, the pastel colours, the way complimentary colours have been placed side by side for dramatic effect, and the simplicity of the colours used . The style is impressionistic and lively because of this use of colour and modeling. The south chapel off the narthex has a firmly shut glass door which is a pity because it is the most interesting chapel of all. It contains the stairs to the upper gallery which, apparently when the monastery was a going concern, held administrative offices. Written on all four walls are white scrolls all with copious writing about two centimeters high, all unfolding from “Heaven” above and guarded by angels. 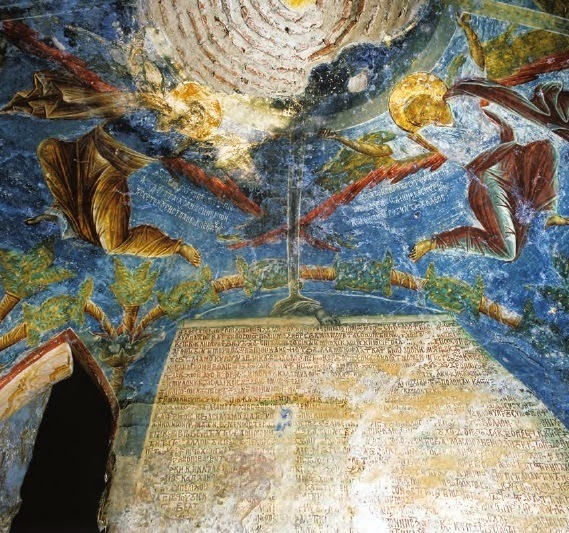 Originally Christ would have been in the dome and from the mandorla surrounding him a ray reaches out down each wall with an ethereal ‘hand’ at the end holding a scroll. This is not subtle symbolism. It simply shouts out: from the hand of God via the hand of the emperor to Pachomios. Pachomios recorded here for all to see a record of each and every Chrysobull in the monastery’s possession and therefore of each and every holding to which the monastery had rights. This was not merely to boast although that element is there – he must have loved the flattering references to himself and his ‘boundless efforts” - but to create a more permanent record of the monastery’s holdings than ephemeral parchment. In this he was proved right – the only record still extant is in these painted Chysobulls. They provide the information we have today about the wealth of the monastery and about the feudalistic system under which the locals tied to the monastery worked. After all, Mystras was a relatively small enclave and resources were not infinite. (At times monasteries were even granted holdings that were in the hands of the enemy on the theory that they would ultimately be obtained). 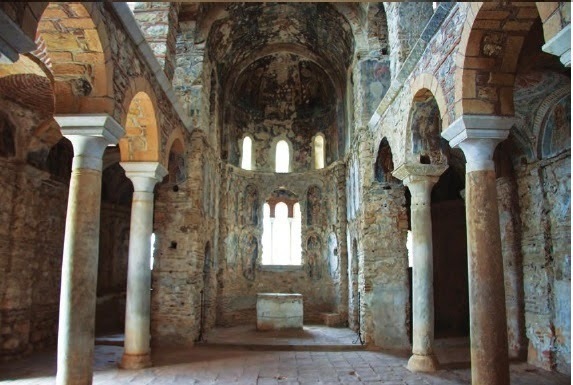 The bishop of Mystras must have felt especially resentful of his rich neighbor next door. 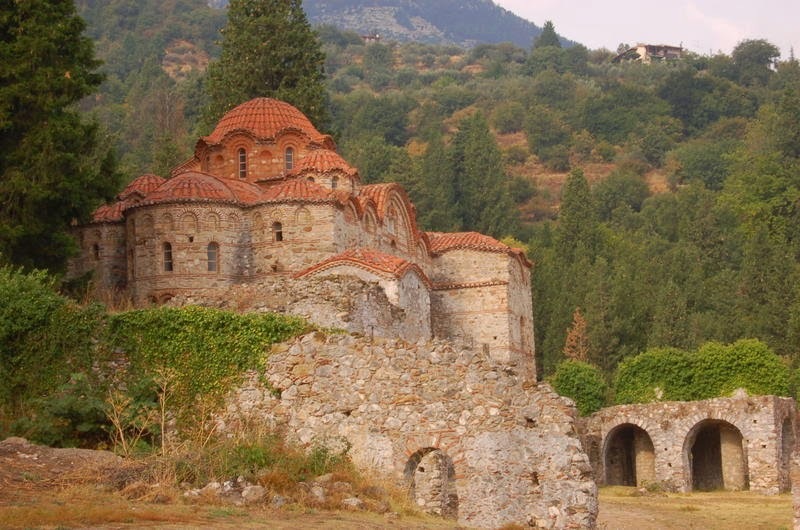 Remember that monasteries in Mystras tried and often succeeded in ensuring that their holdings came from the Patriarch or Emperor in the capital, thus making them completely independent of the local bishop’s control. This meant the local bishop would lose revenues to the monasteries and have to accomplish what he could all the while knowing that he did not have the ‘meson” (pull) of these more favoured institutions. Painting or carving the monastery’s rights for all to see was one way to claim that any gains made were ‘forever’. Closing the room with a glass door and not providing good lighting is the Byzantine Ephorate’s effort to see that they do. 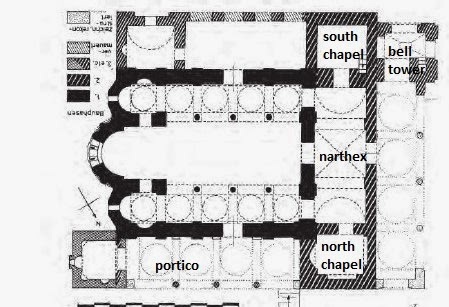 The north chapel off the narthex was for burials of important personages. Pachomios himself is buried here. Unlike his desert forebear who started ascetic monasticism, our urbane Pachomios fully intended to be buried in style in ‘his’ church with a fitting epitaph and a lot of painted saints for company. 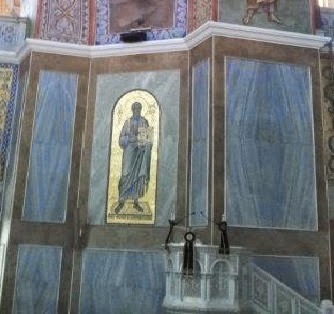 This chapel extends upward two floors and is still decorated with many frescoes. The Pantocrator is in the dome. There is a Deesis high up and Christ enthroned in glory as a judge – fitting depictions for a funeral chapel. On the lower walls is a parade of prophets, Apostles, patriarchs, martyrs and ascetics, all walking from right to left the very people those buried here would want to be with for the wait until the Second Coming. An inscription begs the Virgin, the Baptist, and all the saints for mercy and the salvation of the souls buried here. 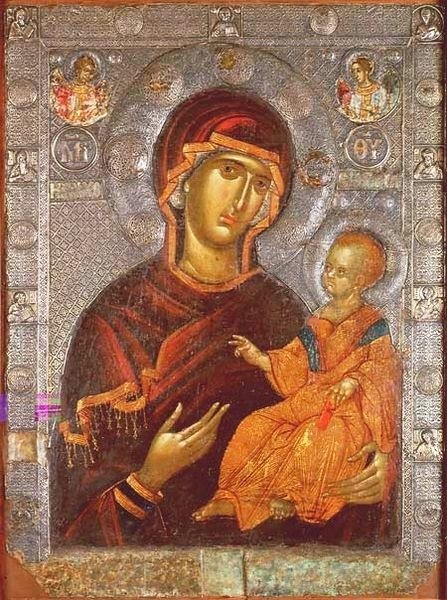 (1) When the Byzantine’s had recaptured Constantinople from the Latins in 1261, the icon of the Virgin Hodegetria, said to have been painted by the Apostle Luke, had lead the victory parade back to Hagia Sophia. 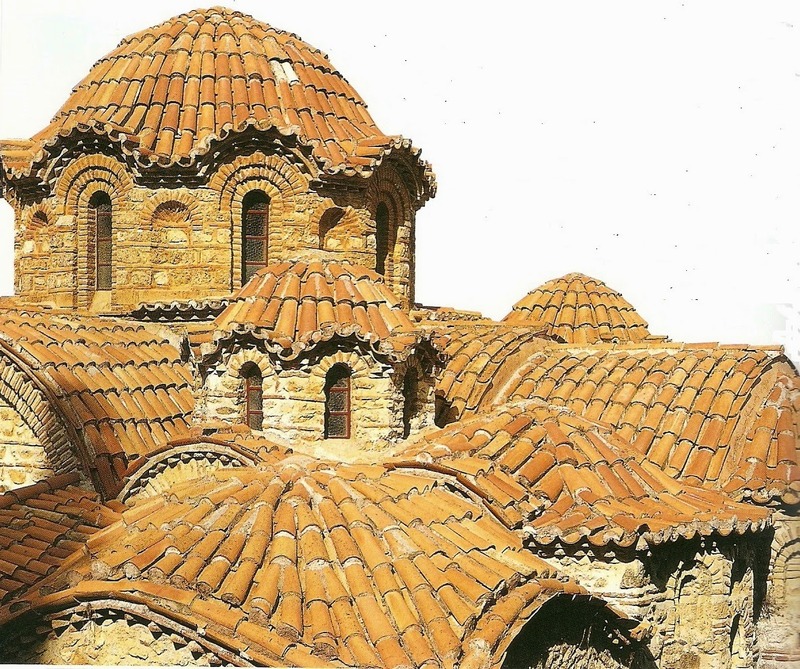 By naming his church the Hodegetria, Pachomios was tying his monastery even closer to Her protection as well as to the capital's aura, if you will. (2) I am not sure if the original bell tower is actually a true replica of the original. Its top was rebuilt by Professor Orlando when the church was restored in 1838. The new bit looks out of place- to me anyway. http://www.academia.edu/3688211/Gerstel_Mapping_the_Boundaries_of_Church_and_Village_in_Viewing_the_Morea She kindly gave permission for me to use some of her illustrations.